Click on the infographic above to view in full size. Order the printed poster here or get the PDF version here. I thought Facebook uses PHP? Why is Python everywhere? Is PHP for small sites only? I’ve received a lot of questions and misinterpretations of the infographic, which is understandable. There’s only so much information I can squeeze into an infographic. Check out the full explanation of the infographic & FAQ at the end of the post (Click here to jump). Here is the compiled list of the best courses, tutorials, books, etc. for each programming language. Feel free to suggest any new resources to keep this list growing! Beginners read this: IDE stands for Integrated Development Environment. It is a tool that facilitates developers to write code, which normally consists of a code editor, compiler, and debugger. Also, you need to understand some important concepts behind programming. Check out: 40 Key Computer Science Concepts Explained In Layman’s Terms. Start with a code editor like Sublime Text, then maybe move on to IDE like PyCharm or PyDev for more complex projects. A great car analogy: How to explain OOP concepts to a non technical person? A more detailed version: Java Tutorial: Don’t Fear the Oop! A good read about why C and C++ are different languages – Should I learn C before learning C++? For front-end developers, you must also learn HTML & CSS. Probably jQuery as well. For what reasons should I choose C# over Java and C++? Note: Theses resources are mainly for Ruby on Rails framework only. Should I learn Swift now instead of Objective-C if I want to be an iOS developer? What’s the difference between Objective-C and Cocoa? You may want to learn Swift as your first/next language. 8 – 16 years old: Scratch – Create your own games, stories, and animations easily. 10+ years old: Lego Mindstorms – Write programs to bring the robot to life. 3 – 8 years old: Robot Turtles – Board game that teaches programming. Once your kid has learned the fundamentals of programming, you can proceed to teach them Python (Refer to “Python” tab). Treehouse (First month is free): Best for absolute beginners. Choose this for your very first course. Codeacademy: Awesome and free courses for beginners. Code School: Recommended as your second/third course. Suitable for “intermediate beginners”. Udemy: Huge list of online courses. Some are excellent. Remember to read the course reviews before signing up! Lynda (free 10-days trial): Have some great beginner’s courses too. 1. Why is Python everywhere? Are you a Python fan? There are tons of debates that argue other coding languages are better, but I think we should to stick to the majority opinion. I’m recommending Python to most beginners, but it doesn’t matter THAT much. Whether you are more of a Ruby or Python programmer depends on your personality. If your favorite toy at a young age was Lego, choose Python. If it was clay, use Ruby. C gives you more control than Java. You don’t have to worry about shifting gears (e.g., memory management) in Java, but you may be able to drive (execute code) faster and more efficient in C.
4. I thought Facebook uses PHP? Is Google using Python only? Both companies use multiple coding languages like Java and C++. In this case, we should follow the rule stated in #1. The bottom line is, you definitely need to learn more than one programming language to get a job in most companies. 5. What are the challenges that programmers normally face? Staring at your supposedly working codes for hours. You end up spending a lot more development time that you think. You are certified and assigned to fix anything that has to do with computer. 6. Is PHP for small websites only? Why is PHP so frequently used on web servers? Should I learn PHP in 2014? Do you agree with the flowchart? Let us know in the comment section below. Also, feel free to suggest improvements as I will be constantly updating the infographic and content when necessary. Fixed! Can’t believe I missed this. Thanks for spotting the typo. Like when writing a story, the language you use is not a big deal. Programming is not about the language you use. In some programming languages, like in Python or Ruby, it’s a bit easier to grasp some concepts because they read more like plain English. For the same reason, it doesn’t matter what platform or motivation you have, C++ IS NOT a good first language to learn! My piece of advice: Go Python. After some time playing with basic scripts and small console programs, go learn what object-oriented actually meant, even pulling the string from the WP article will be a good start. Only then, when you got bored played with Python, come back here and follow Carl’s nice infograph! I totally agree with you. That’s why Python is listed as the easiest and best option in the flowchart. When you are in doubt, choose Python 😉 . Mostly because its free, and students cannot afford to host on windows server.. but maybe iwth ASP.NET 5 that will change. C# and MVC is defiantly easier than Python and sooo much more convenient…. but the problem is the deployment process and the fees needed. MonoIDE is free and good, .NET5 is in beta and can self host OWIN on almost any platoform now 🙂 We need more C# developers! Agree. That’s why I mentioned in the flowchart that it will be easier to pick up other languages in the future. It all comes down to whether you want to learn coding the hard way. If you love challenges, go for C++, but make sure you have proper guidance too. I’m planning on doing videogames (learning unity right now, but planning to switch over to UE4 when i upgrade my card) what should i do? do I stay in unity and keep up with C#? So you’re saying you should start with the language that makes all the other languages feel like a breath of fresh air? Or that your first language should teach you all the concepts you’re ever going to learn? Neither of those interpretations sit well with me. I think this is a chart for deciding which language to learn *second*. Before you try your hand at the suggested language, spend a few months toying with Python or Ruby. Then when you get to C++, you’ll not only have a handle on a lot of the concepts, but you’ll actively seek out obscure bits that will make your life much easier. For example, Ruby has regular expressions and dictionaries/hashes built right in, so you’ll immediately look for ways to make use of that functionality (even if it requires pulling in new libraries). Also, the “do X to an array of objects” (.map, .each, .inject, etc.) are a good lead-in to C++ generics, templates, containers, etc. When it’s time to introduce them in C++, the student has already seen how powerful they are. They won’t work as hard to find workarounds to avoiding learning them. I can’t be certain, but I suspect if you’d taken a few months with Python, you could have saved about a year learning C++. You can target Mac, Linux, Android and iOS with C# and Xamarin/Mono, FYI. Yea in ASP.NET 5 that is possible.. and should be a “super set” of languages next to those. The core advantage is obvciolsy WIndows Phone and desktops. But also ASP.MVC is so bloody easy, I would say its easier than Python (for Windows Dev) But going back to your comment, I am actaully trying to deploye an .NET 5 MVC site to FreeBSD with MySQL backend… so that makes it even easier for Linux brewed guys to get into C# – Als the Mono IDE runs cross platform and is pretty good Visaul Studio Alternative. I think .NET is going to be a paradigm shifter in 2015! Good bye PHP, finally! Objective-C can make iOS & Mac app, not web page, you use the wrong icon. Regarding Java IDEs, I would propose that IntelliJ be listed there, too. The community edition is free and great for Java development, especially in the early stages. I’ve used Eclipse quite a bit in the past and I’m not knocking it, although my preference is for IntelliJ. In particular, I find that the IntelliJ Maven integration is superior and that is a really big win for me. Thanks for the suggestion Nick! I’ve added IntelliJ into the list. I personally had only used Eclipse for Java development, but I’ve heard some great feedback about IntelliJ. * Have 100’s of different script processing and transforming information. * Communicate between servers to share the load of every thing above. That is, besides serving the whole front end of our site. PHP is not for “small and simple sites”, and saying that is misleading. It’s very stable and easy to develop, my scripts never fail, don’t eat up memory or behave erratically, ever. I am not saying that python is a bad language (it’s amazing), or that people should learn one or the other, but you are, and when doing so, you are misleading the readers because of your personal preference. * If you want to work for facebook, learn PHP, it’s what they use, otherwise this wouldn’t open: https://www.facebook.com/index.php (and should learn C to work for google, but that’s another discussion). * If you want to work in anything web related, learn PHP, after all “It is still the most popular server-side scripting language”, it’s been like that for years, wont change anytime soon. I apologize for the misunderstanding caused. I’ve added clarifications in the infographic explained and FAQ section. Please refer answer #1 and #6 for the explanations. Actually, nope. No bad days have ever come our way because of PHP, ever. It’s fast, stable and reliable, which is what you want for the language that makes the core of your business. We are very cutting edge company and do some pretty advanced stuff. We adopt new technologies whenever it makes sense to do so. If PHP was the source of any of our issues, we would have moved to another language long time ago (we do use other languages when it makes sense). I am not advocating for PHP, nor saying it’s the first language someone should learn (actually, it’s a very bad idea to start with PHP — I would suggest Java or C, because if you can program there, you can anywhere else). But I think people have this misconception that it is old, bad or only for small stuff, when actually it’s not, and saying otherwise seems a bit ignorant. The reality is, you can use it on any kind of web projects, no matter how big they are (facebook?). It sounds like people dislike it because it’s ‘popular’ and not ‘cool’, but those are completely invalid reasons to base a learning decision, which is what this article is all about. Only because .NET doesn’t run free on Linux.. oh wait, it does and its free. It will soon be replaced and as Apatchme got replaced with nginx, while IIS is catching up to nginx, so will PHP with ASP.vNext. I currently run Kestrel behind nginx with full blown ASP.NET WebApps and when I publish my book, even more newbies will realise the power of Visual Studio and the comfort of programming in .NET. I have been in the land of PHP because I hated ASP.WebForms, but came back because I realised PHP was far more worse. And now we got SQL Server running on Linux too, for free. PHP has died about 10 years ago you say? Sure I would agree – oh wait, sorry I forgot, PHP is probably the most widely used server side language with some 82% of web servers running PHP compared to the 17% that ASP.NET claims (source: http://w3techs.com/technologies/comparison/pl-aspnet,pl-php – Updated April 16th 2015). All I’m hearing from you is that you’re a typical PHP hater. And for reference, yes I’m a PHP developer and proud to be. So, as I underdood you stopped using PHP 10 Years ago and didn’t approach to it anymore for such a long time? I guess you missed a lot of new functionalities/features and implementations especially starting with PHP 5 and later 5.3. I’m not going to bring you external link to show how much popular PHP is… Just make a simple google search and enjoy with results, but I really think that a sentence like “PHP has died about … 10 years ago mate” denotes deep ignorance and, maybe, a pinch of self frustration. I am so much agree with you Alex!!!! I think python and java good. Ada would be Galadriel. Elegant, wise, makes a lot happen without fuss. But probably seems quite unkind to beginners. For .NET / Java platforms I’d suggest newcomers to pay more attention to mixed functional-OO languages of each ecosystem: F# and Scala respectively. More and more teams adopting them but it’s happening too slow as supply of specialists is close to none and re-learning from OO paradigm to FP is a painful experience even if you’re motivated. Why not Haskell? I picked it up as my third language, but I really liked pure functional programming over object oriented programming; Haskell just seems to me to make so much sense, and the syntactic sugar has some real thought behind it. Probably one of the best things to ever come out of a committee. Totally agree. Visual Studio Express web edition you can bang out an MVC site with Entity in about 6 hours, that actually does something usefull. It defiantly belongs in the Easy bit, alongside Python. Why do you only choose one?? It is possible for Python AND something else to be easy! Thanks for the suggestion Arne and Peter. Just updated the C# section in the infographic :). Wow, how is it possible that I vote for C# and the result is, 0 votes? C# is reeeeealy underestimated on this chart. ie, its the goto webdevlopemnt in Europe at the moment. Hotbed for MVC apps. With ASP.NET 5 with cross platform…. its going to smush even more. The PHP bit… well, that true, old,s tinky toy that works but leaves a bad taste. I was wondering why the poll receives so few votes, seems like there’s some issues with the voting plugin. Will look into it. Thanks! Kurt, your pandering is nauseating. If you really want to help an aspiring female programmer, teach her some programming. Why are Joomla and Drupal not in the list ? They are CMS, not computer programming language. Is strong, has great endurance but is somewhat difficult to deal with. Long ago was one of the most popular languages for webmasters and system administrators. Has a complex syntax, often dubbed a read-only language. Thousands of modules readily available makes it a good choice for system scripting and text manipulation. The release of Perl 6 might mean the resurge of the language. 10 years ago, the release of Perl 6 might have meant a resurgence for the language. For now: python is the best. And as a first language too. Very interesting ! Congrats ! i want to launch a web based startup in the future which is the best to learn between python and ruby/ruby on rails? Kids, don’t jump straight into COITUS, first you should learn how to KISS ! Note: COITUS – COmputing ITerations Usage and Standards, KISS – Keep It Simple Stupid. What’s The Best Programming Language For Beginners To Learn First? Are there none with a difficulty rating of 5 stars? I see C++ has highest difficulty rating of 4 stars. I followed the flow chart and answered how I just want to learn for fun because I recall taking a COBOL class (eons ago) and how I enjoyed it, and was top of the class, and I enjoyed any other little computer thing I taught myself. But alas, I haven’t tinkered with any other programming or coding, and would like to do that for the challenge. I figure I’d earn money with whatever avenue I choose, so I’d rather make a choice based on what would be enjoyable even when money isn’t an issue. only because you know how to write it, you dont know how the interpreter will deal with it. prototypes, scoping, event orientation, getters, setters, design patterns etc.. it took me years to get to a level where i could write 10000 lines of code without running them once before i’m done. and i’d say c and python are the simplest among the listed ones because their interpreters will not do magical stuff in the background that might change behavior of your methods. c++ however does magical stuff. c# is insane about it and java throws lots of exceptions for stuff you didnt code yourself even though you are the one who did a mistake. now dont blame me for this. this is just my opinion on this topic. i’d just say this picture is outdated. I work in data analytics for public safety using crystal reports. I have also written some SQL reports over the past 10 years but not every day. I need to know the best and most efficient avenue for me to fast track and improve my syntax skills both crystal, basic and other. Not sure if I need to focus on a intro to programming class, python, VB, C, or sql or crystal class / training. I really don’t have time to go step by step through basic crystal classes as I am good with creating basic to mid level reports but I need help with specific things like combining multiple reports, conditional filtering, summary by fiscal years and other specific things that come up during my work day. I get lots of urgent ad hoc requests and need to be fast and accurate. you be a designer, not a programer, nice graphics.. I have an old, ugly toy but I love it so much. Hey, Did you know BusinessInsider featured your work: http://www.businessinsider.com/everything-you-need-to-know-about-coding-in-one-infographic-2015-6 ? Sure will consider to add Swift since the infographic was last updated about 6 months ago :). – …but open-source is goooooood…..
Gaming > C++. But for a newbie, isn’t the best thing start with engines? I’m very confused if I have to start with C++ or try Unity Engine. I want a job programming games, but have too much choices and I don’t know how to start. C++ if you want to get into AAA industry, Unity for indie. 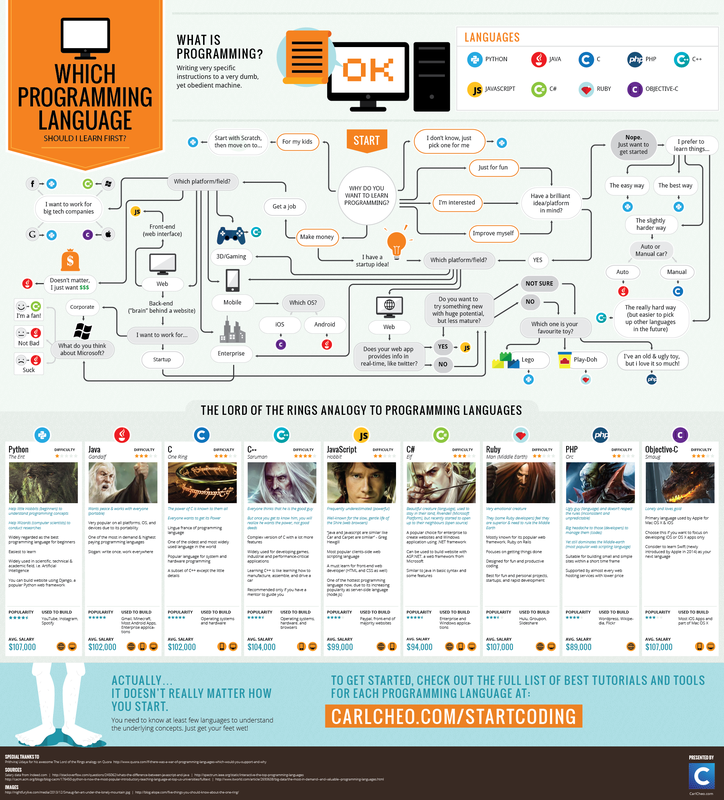 Nice, but you missed Ada (as Galadriel of course) which is the language that I would recommend to learn programmation. Good habits from the start! Where’s LISP, Forth, or *** Assembler *** for cry’in out loud? Some people (like me) prefer the most powerful, expressive, interactive, and flexible language available, and by excluding those three, you are doing people a disservice. My suggestion is to change the infographic about PHP. It not sounds good and it’s not a real resume about the language. The bad programmers of all languages don’t make a bad language (or a ugly language as you said about PHP). I trully recommend a change. If you consider my suggestion, I could help you writing something different. I guess this approach on php comes out from a lack of knowledge of the language itself and its potentiality. Don’t forget Xojo, nee realBASIC, closely related to Visual BASIC .net, using a similar syntax to the old BASIC languages. Simple and understandable object oriented language that compiles on to many modern web, desktop OS, and mobile OS platforms. Nice language, but with a REALLY small market share. And you know what, once you are done with beginner level, you should start writing code snippets, nothing else can teach you better. Carl – thank you so much for creating this. We have a copy up at our Birmingham, AL makerspace, Red Mountain Makers. We’ve also been taking it out to community outreach events, where it’s been a useful tool to help those interested pick their first programming language. Totally disagree about your analysis on PHP. I’m also thinking that you don’t have an appropriate knowledge of the language and related tools/frameworks to bestow judgments and rulings. Perhaps you meant Symfony and Silex! So if C is a subset of C++, then you are saying C came AFTER C++?! ?